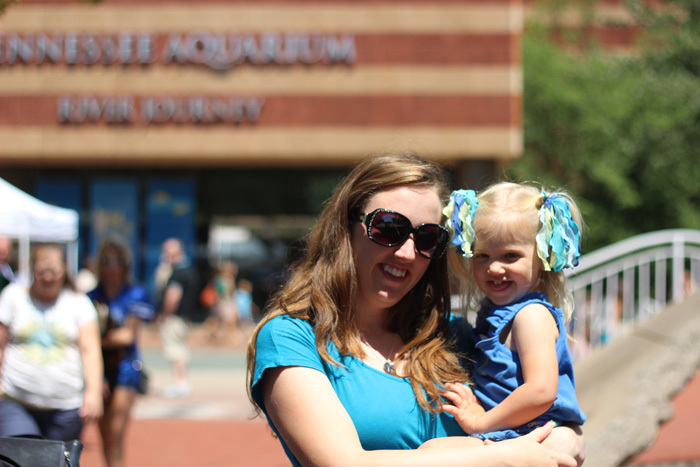 During a weekend visit with a friend Sweet T and I had the opportunity to visit the Tennessee Aquarium in Chattanooga, Tennessee. The aquarium is celebrating its 20th anniversary this year and I can remember enjoying days in the River Journey building as a child. However, the Ocean Journey building opened in 2005 and this was my first visit there. I’m glad Sweet T and I got to experience the wonder together! We brought a couple of friends with us who were a big help with a busy toddler and allowed me to enjoy taking some pictures. 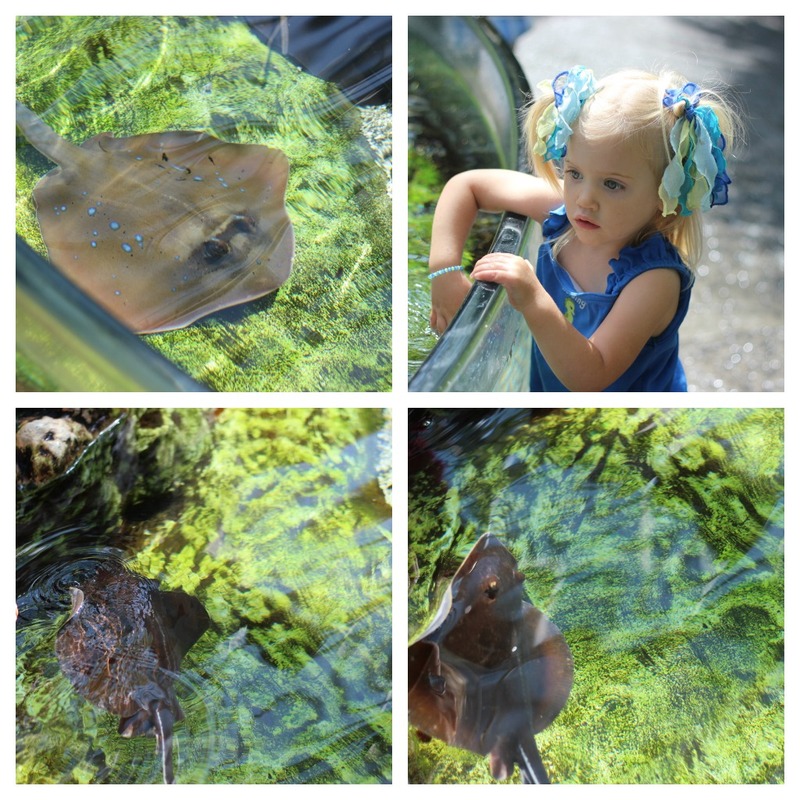 Our first stop in Ocean Journey was the hands-on stingray station. Sweet T mostly liked splashing in the water but the rest of us were sure to “pet” a ray or two. They weren’t shy at all! 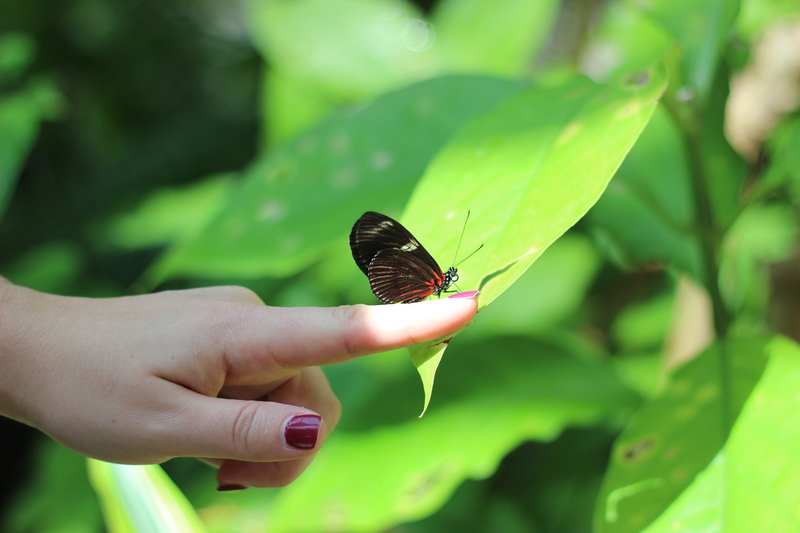 While traveling to the next exhibit, visitors have the opportunity to interact with various butterflies in the aquarium’s butterfly garden. Lexi almost coaxed one onto her finger. 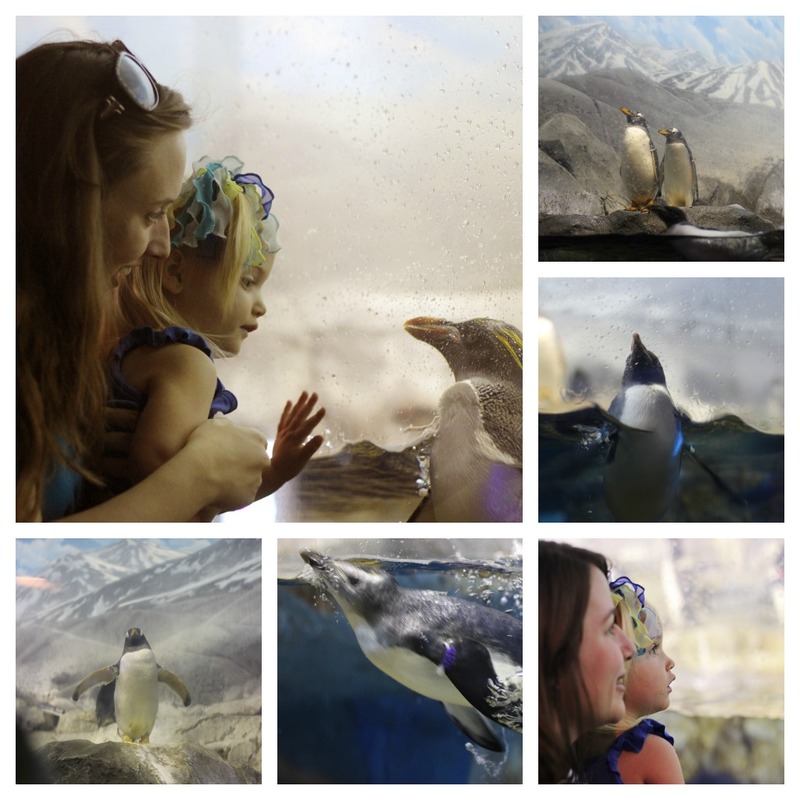 Next we visited my favorite feature of the whole aquarium: the penguin habitat! I could have watched them all day long since they were so playful and friendly. One kept treading water right by us for minutes on end just to hang out with us I guess. Sweet T kept saying “penguin out!” and I agreed with her. A couple should be happy in our bathtub at home, right? Each penguin has a name and can be identified by the colored bands on their wings. Simply check the color chart in the exhibit to know if you are looking at Nipper, Zeus, or Little Debbie. It’s amazing how much personality each one displays. Moving on, we encountered a special dive show at the Secret Reef where scuba divers answers questioned from guests. I guess every week is Shark Week here! 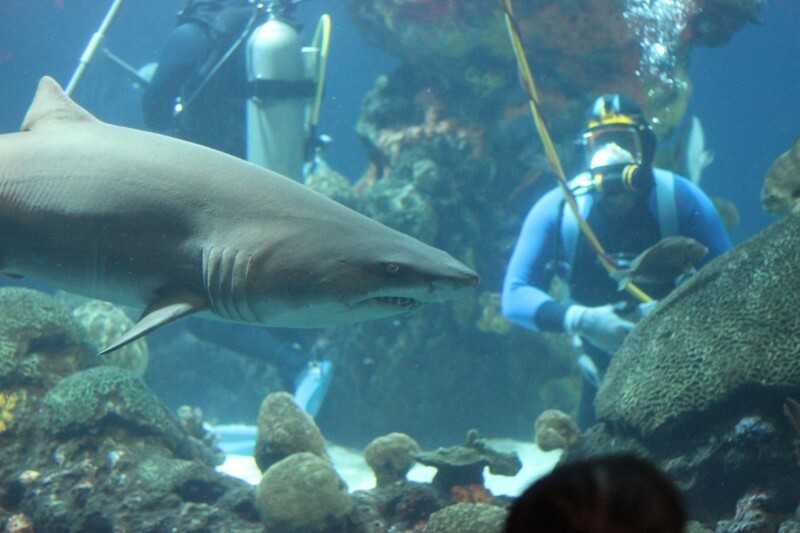 We only caught the tail end of the session but I did learn that sharks eat less often than you’d think and as that as long as they aren’t hungry leave the divers and their tank-mates alone. 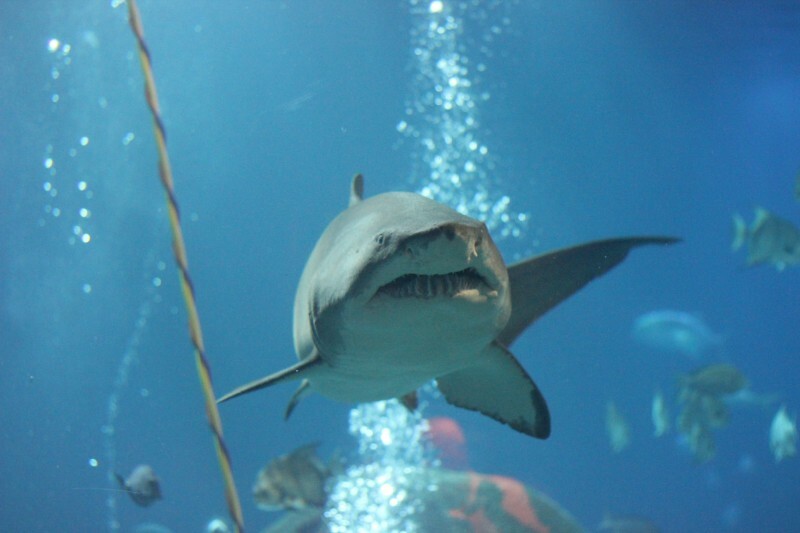 I’m hitting the highlights of our favorite parts of the Tennessee Aquarium, but don’t think that there’s ever a shortage of things to see between major attractions. 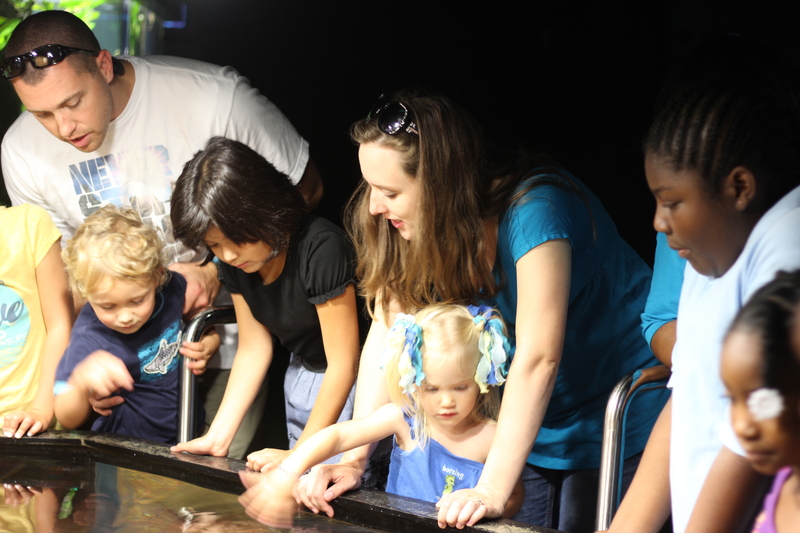 While walking from floor to floor you’ll be surrounded by fresh and saltwater fish, birds, reptiles, and amphibians, as well as lush plant life. 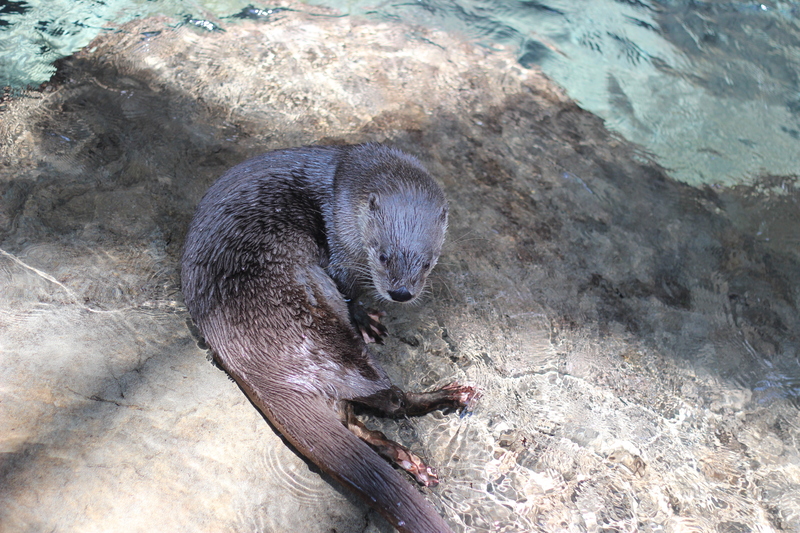 On the River Journey, Lexi best enjoyed the otters. What’s not to love about those little guys? 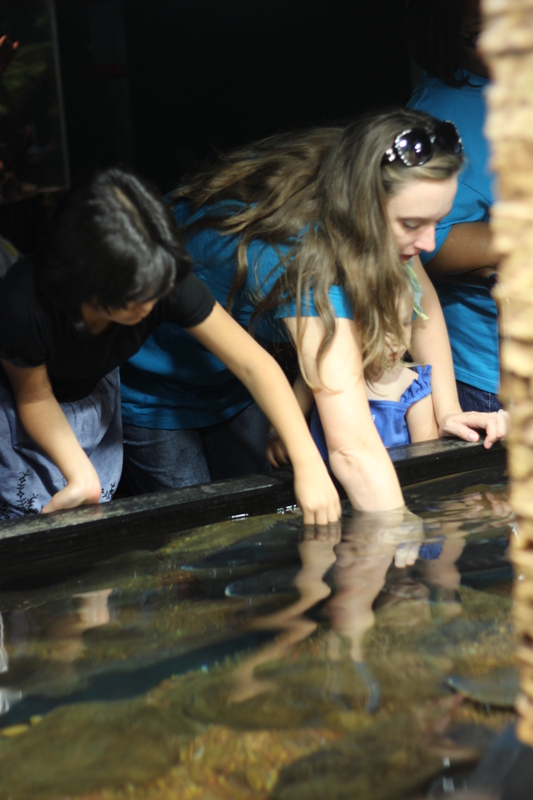 The kids loved the hands-on sturgeon station where they were able to touch and feel the friendly fish. It seemed like the sturgeon would actually stop to be “petted” once they felt your fingers on them. Major win with the kids! To round out our adventure we had the opportunity to participate in Ranger Rick’s Backyard Safari for some up close animal interaction. It was perfect that we caught the bird show since I’m not sure how Sweet T would have felt about tarantulas and snakes. This beautiful girl was my favorite. She was obsessed with a service dog in the corner and would only briefly face the crowd so that’s why I didn’t capture a picture of her big orange eyes. I wonder if she was viewing the dog as a potential threat or a potential meal! 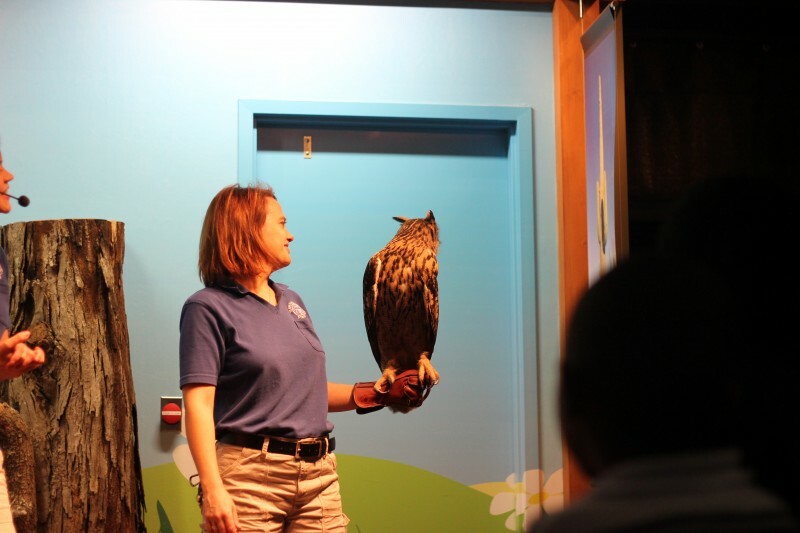 With toddler in tow we ending our day early, but there’s lots more to see at the Tennessee Aquarium including an IMAX theater and the River Gorge Explorer which takes guests on 2-3 hour cruises on the river. 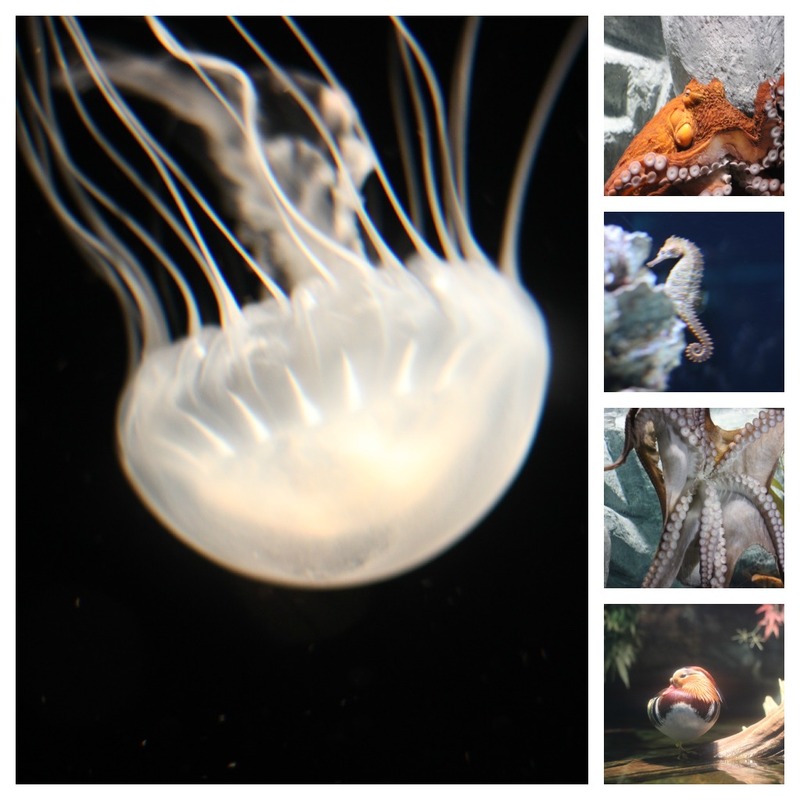 The Tennessee Aquarium is a must-see if you are visiting the Chattanooga area. We’ll definitely be back to visit “our” pet penguins! Disclosure: I received two aquarium passes in order to facilitate my review. No other compensation was received. All opinions are my own.